Camp site is functional - with kitchen and tents ready to use! Let Moreton Bay Escapes take your group away to Moreton Island National Park, With a choice of 5 magical campsites, Tangalooma Wrecks, Ben Ewa (Tangalooma beach -west coast). North Point (Grass campsite) Blue Lagoon (eastern surf beach) and Bulwer Campsite (northwest coast). Each Moreton island campsite has a unique natural environment with many activities being within walking distance. Let Moreton Bay Escapes make your next social weekend event something very different. Moreton Island is a 38km long sand island just 30kms from the Brisbane River. It is 98% National Park which protects its abundant wildlife, beaches, vegetation, freshwater lakes and streams, and its magnificent coastal sand dunes. 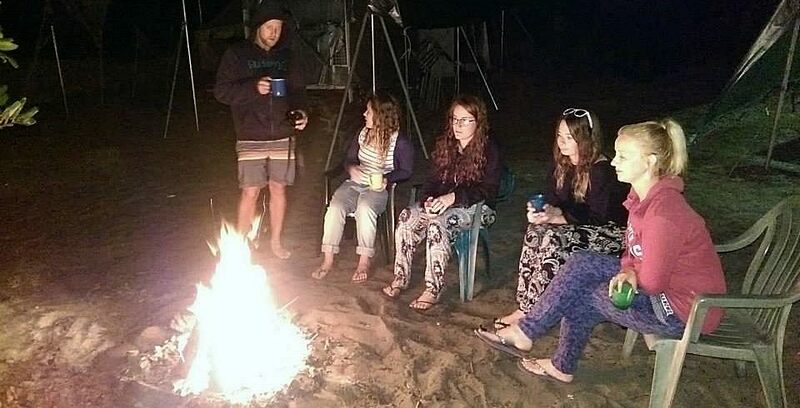 We offer recreation group camps and campsites to the Social groups, sporting clubs, corporate, business sector for relaxing weekend getaways, team building activities, or just comfortable family group accommodation in a unique camp setting in Moreton Island National Park for groups of 10 to 100 people. With your camp being set up when you arrive, you will have more time to enjoy the calm, clear waters of the foreshore directly in front of the camp & immerse yourself in the Moreton Island lifestyle with swimming, snorkeling, fishing, relaxing or an array of beach sports. Then watch the sunset over the bay, toast marshmallows on the campfire and be amazed by the bright stars in the night sky. Looking for a little more privacy or seclusion? Try our campsite on Moreton Island's east coast at our Blue Lagoon camp. There are 6 Main National Park Campgrounds around the Island, with facilities (toilets, showers). The Tangalooma Wrecks campsite is a short walk from the ferry. 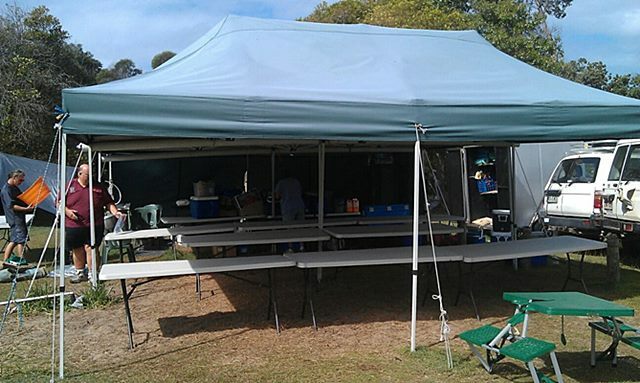 This camping area is just a stroll from Tangalooma Resort a sheltered deep bay overlooking Moreton Bay Marine Park. There are 21 sites available; the surface is sand and is surrounded by native shrubs and trees. Vehicles can park on the beach a short distance from the campground. If groups booking are required please contact the office 07 3880 2945. Stay in 1 of 60 cabin style tents, grouped under large shade covers that are amongst the shady trees for complete weather protection. There is also a large covered dining / recreation area with full lighting. The camp is isolated from other campers and is adjacent to the national park showers and toilets. Your group can have exclusive use of our venue. We also offer kayaks, snorkel, and fishing gear, campsite, lighting, gas BBQ included in the price. Each tent fits from 1 to 6 persons with mattress and sleeping stretcher included. 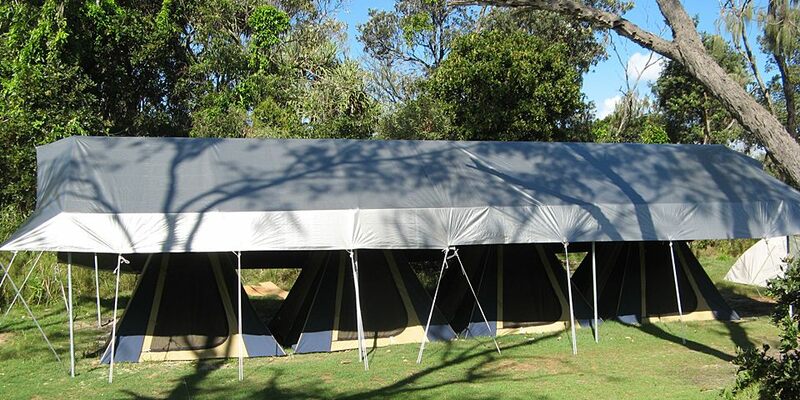 Moreton Bay Escapes can supply single tents, giving room for each camper to enjoy more space (Bring your own bedding eg. pillows, sheets. A favourite with families and couples because of the sheltered Moreton Bay waters, Ben-Ewa’s valley location provides protection from strong winds and offers many a shady tree. The site is on the western side of the island, 1km north of The Wrecks. This northern Moreton Island National Park campsite is within walking distance of the Bulwer township. Located on the island’s west coast, this site has 49 camping plots marked with totems and plenty of shade. This campsite is popular due to its proximity to facilities in the township of Bulwer and its central location to access 4WD tracks to North Point, Blue Lagoon and the Cape Moreton Lighthouse. This campsite offers sheltered waters. Open fires are allowed, but you must bring your own firewood. On the northern tip of the island between Yellow Patch and Cape Moreton, a large grassy site close to the surf beach and within walking distance of Honeymoon Bay and the Champagne Pools. There is a maximum of 17 sites available. Treat water before drinking. With beautiful walking trails to the nearby lake and close proximity to the surf beach this camping area is in a gorgeous spot on the eastern side of the island between Middle Road and Cape Moreton. Trailers and caravans are permitted, but due to the soft sand on the one-way track they are not recommended. The site is also within walking distance of the Blue Lagoon campground. There are a maximum of 25 sites are available. Bring in your own firewood and treat water before drinking. Includes your tents (already setup), all your meals and snacks, drinks (BYO), all camping permits & National Park fees. We can supply transfers and transport from the ferry to the campsites and return. Choose from a range of menus from affordable to gourmet. Our mouth watering meals are cooked from our fully equipped mobile kitchen and served buffet style. Menus on request. We can also arrange a package deal including your passenger or vehicle ferry trip across Moreton Bay. 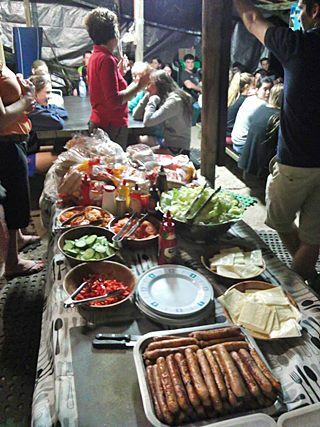 Includes use of our campsite with uncover areas, tables, chairs, lighting and facilities,your tents already setup, with all camping permits and national park fees included, With a fully equipped kitchen, BBQ and all the necessary equipment, crockery and utensils, even the kitchen sink with hot water facilities. You and your group will be cooking up a storm. We can tailor a camp to suit your requirements and budget.